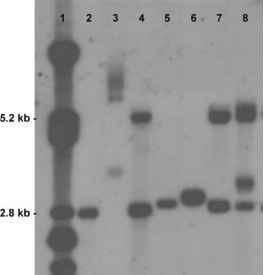 Earlier studies of molecular genetic variation in Echino-coccus involved restriction fragment length polymorphism (RFLP) analysis using the conventional Southern blotting approach. It was able to distinguish several distinct strains of E. granulosus, and extensive study showed that RFLP patterns were stable within a particular strain. The conventional RFLP procedure was simplified, without loss of resolution or accuracy, by linking RFLP analysis with PCR targeting the nuclear rDNA ITS1 region. The random amplified polymorphic-PCR (RAPD-PCR) has also been used under carefully controlled conditions for distinguishing the four recognized Echinococcus species and genetically distinct forms of E. granulosus.